Of all the hair loss patterns probably the most common is when the hair loss starts in the corners of the hairline and works its way back leaving a central tuft of hair that looks like a mohawk. Luckily for many people, this is as far as their hair loss will go so all that is needed is to rebuild the hairline and fill in the “triangle” of hair behind it. Sounds easy, but there’s a bit more to it than that. In the old days this was tried using PLUGS and then MINIGRAFTS and the results were almost always thin and unnatural. 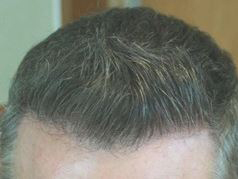 However, thanks to physicians like Dr. Scott Alexander of Phoenix, AZ this kind of hair loss can be addressed without creating a strange looking hairline. This is because he was an early adapter of Follicular Unit hair transplants along with dense packing which revolutionized surgical hair restoration. be to rebuild the hairline and pack in the area just behind the hairline. The challenge was to make the rebuilt portion of the scalp match the hair thickness of the rest of the scalp. If he got that wrong no matter how well he executed the hair transplant it would never look quite normal. But due to Dr. Alexander’s skill and extensive experience he was able to find the right balance and get the job done in just a single visit. Notice how the new hair blends well with the original hair. Also notice that he matched the existing angle of the hairline itself so that the casual eye could not tell new hair had been added. 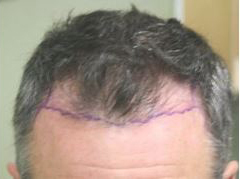 The hairline is by far the most difficult portion of a hair transplant to get right but clearly Dr. Alexander has mastered the different techniques and approaches required to succeed. Dr. Alexander hair transplant patient. Hair Transplant patient of Dr. Alexander.